[Ozu's] sense of generational conflict in a society at risk from within is here at its sharpest and most anarchic. 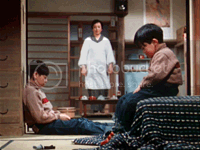 Perhaps the most delightful of Yasujiro Ozu's late comedies. A brimming sense of life, in other words, gradually transforms the small talk into a richly devious portrait of humanity being human. Good Morning is such a fantastic surprise, and worthy of discussion among any of Ozu's better known dramatic works. As unpromising as all this may sound, Good Morning is another Ozu gem, a covertly sophisticated ensemble piece scripted with the intricacy and precision of a well-constructed Restoration comedy of manners. It's Ozu's simplest and most schematic film, a lighthearted comedy that is built around the motif of changing values from the old to the new. Ozu's most charming foray into comedy since his silent days. Ozu's delicate, wry comedy of manners takes a sympathetic but not uncritical look at life and etiquette in a small 1950s Japanese village community. This is all potentially interesting, to be sure, but the ideas are wrapped in a surprisingly innocuous package. This may not be one of Ozu's most acclaimed works, yet its contemplative style and its qualities of humour, tenderness and absence of cynicism make for an absorbing film. Ozu said he wanted to make a film about people's inability to express the important things, but natter on about unimportant gossip. This all comes out thanks to two boys that really want a TV. They enter into a vow of silence until their TV comes. This silence is misconstrued by the neighbours, who think their mother is angry at them. They begin to gossip amongst themslves and rumors soon start. Meanwhile, the young boys' aunt and teacher are attracted, but fail to act on their emotions. This is a lovely little film, filled with some great humor. Though, I must admit, there was a bit too much focus on the poo/farts jokes. The two boys, especially the youngest, are very cute and make their efforts to get a TV seem less brattish. It's really sweet to see how dedicated the parents are, and even though the kids are kind of mean, they do appreciate the gift in the end. There's no escaping Ozu's look at the clashes between old and new, with the TV looming over all procedures as something that will change life. A little gem, if not one of Ozu's classics. what a hilarious film. unlike any film ozu ever made. although this film does focus on his usual themes of family, multiple generations and the evil that is associated with gossip, the film is different in that it is an all out comedy, and one of the funniest films i have ever seen. the comedy brought in by the gossiping neighbors is classic, but the two main kids really steal the film. the film effectively blends potty humor with intelligent and witty dialogue, and even as an american the japanese humor was effective enough to not be lost due to cultural confusions. great comedy. I haven't seen enough of Ozu's to judge this among his body of work, but as funny as it is, Good Morning doesn't just want to laugh at poor folks, but instead is more of a comical view on society. With great attention to detail and very still camera work, it's definitely a meditative film of two boys representing a younger generation that do not want to grow up with meaningless rituals in a world of empty adult chatter. Ozu's film is not suggesting that tv is the answer, rather talking and expressing feelings is. I like the simpleness of this movie, so I don't want to analyze it too much. It's about boys being (little) boys and how people always talk behind each others back. Asamo is the cutest kid you've ever seen (along with Daigorô in the Kozure Okami TV series). Douse it with a little light Japanese humor and there you have it: a beautiful Ozu.